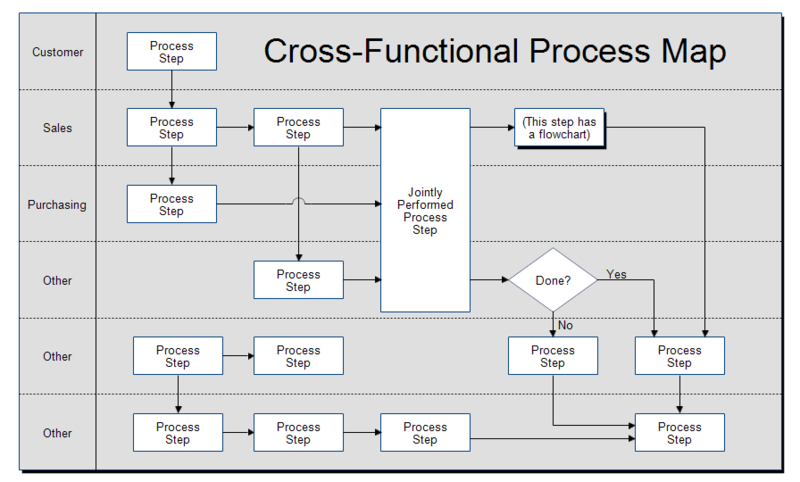 The above cross-functional map is a template that you can use to create your own map. In a cross-functional map the customer, departments and external companies are listed on the left. They are separated by dotted lines so it is easy to see which department does which step. Each department has its own "swimming lane." The steps are connected by arrows to show the order the steps are performed. The flow is generally from left to right. The lines are labeled with the input or output of each step. Double-click on the words Customer, Sales, Purchasing, etc and replace them with the departments or groups you are interested in.